One medium papaya contains 120 calories and 6 g of dietary fiber. Papayas are also good sources of vitamins A, B9, C and E as well as minerals. 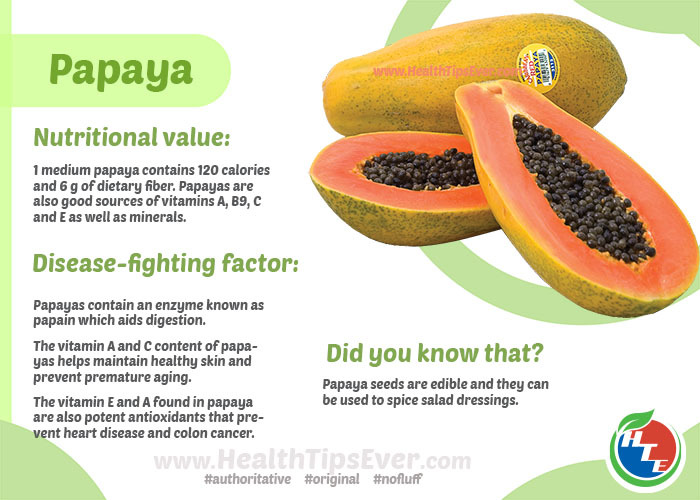 Papayas contain an enzyme known as papain which aids digestion. The vitamin A and C content of papayas helps maintain healthy skin and prevent premature aging. The vitamin E and A found in papaya are also potent antioxidants that prevent heart disease and colon cancer. Papaya seeds are edible and they can be used to spice salad dressings.